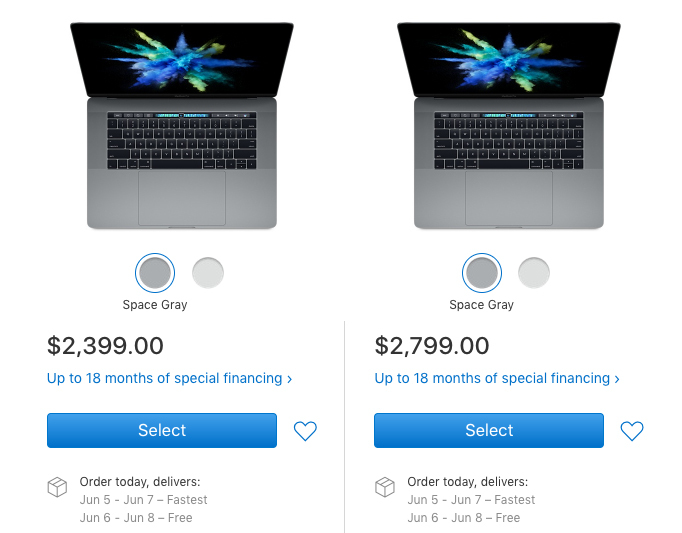 Apple has updated its online store to indicate that 15-inch MacBook Pro orders placed today are now estimated for free delivery between June 6-8 in the United States, coinciding with its Worldwide Developers Conference next week. The delivery estimates lend credence to a report claiming Apple plans to announce new MacBook Pro and 12-inch MacBook models at the WWDC keynote on June 5. The notebooks are expected to receive internal improvements only, including an upgrade to Intel's faster Kaby Lake processors. 13-inch MacBook Pro models remain in stock for delivery as early as tomorrow in the United States and several other countries. It's unclear if that's because Apple plans to refresh only the 15-inch MacBook Pro next week, or if supplies of the 13-inch models are simply more plentiful ahead of WWDC. Kaby Lake processors appropriate for a 13-inch MacBook Pro appear to be readily available, so a refresh shouldn't be ruled out. Nevertheless, Apple has staggered the release of the MacBook Pro in the past. In 2015, for example, it released a 13-inch model in March, and a 15-inch model in May. In 2012, Apple unveiled the 15-inch MacBook Pro with Retina display at WWDC in June, while a 13-inch model didn't launch until October. A spot check shows 15-inch MacBook Pro delivery estimates are similarly as long in the United Kingdom, Australia, Canada, France, Germany, Hong Kong, Italy, Netherlands, Singapore, Spain, and several other countries. Apple last refreshed the MacBook Pro in October 2016, after the notebook went 527 days without being updated. In contrast, only 220 days will have passed if Apple launches new MacBook Pro models on June 5, below the average timeframe of 320 days between any two MacBook Pro generations. You guys are incredible. If apple doesn't update you complain. If apple does update, you complain. You might be happier with a windows machine. Apple, please amaze me... or you'll be amazed by how fast I stop supporting you guys. I've been barely holding on for too long, this is your last shot. ^No, my last post isn't a joke. I'm serious. This product needs an SD card slot. Reduce the price and include a more powerful GPU! I JUST SPENT 4 THOUSAND DOLLARS ON A TOP OF THE LINE VERSION OF THIS MACBOOK TWO MONTHS AGO! AND IT GETS DEVALUED ALREADY?!?!?!?! I think they are running scared right now. Someone I work with really needs a new MBP, I am really hoping (though not expecting) they add a port or two back. But I would guess this will probably just be a minor performance bump. Hoping a 15" WITHOUT Touchbar is one of the new options! if it's true, i would be very happy if apple listens to people. i'm really, really curious.